Your Windows 10 laptop can print documents to only one printer at a time. 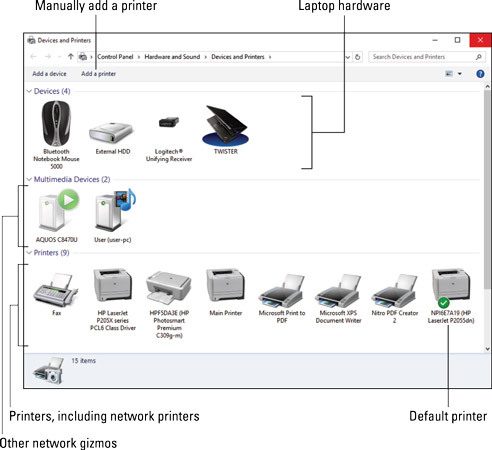 You can choose the printer when you print, or, when you don’t specify a printer, Windows uses the default printer. Right-click the mouse in the lower left corner of the screen to display the supersecret menu. Choose Control Panel from the pop-up menu. Beneath the heading Hardware and Sound, click the link View Devices and Printers. You see the Devices and Printers window. Right-click the printer you want to use as the default printer. Chose the Set As Default Printer command. That printer is now the new default printer. It sports a green checkmark icon.